Rose Window at RPC is an eight trefoil section encircle a larger quatrefoil center. ~ storm unit protecting rose window. 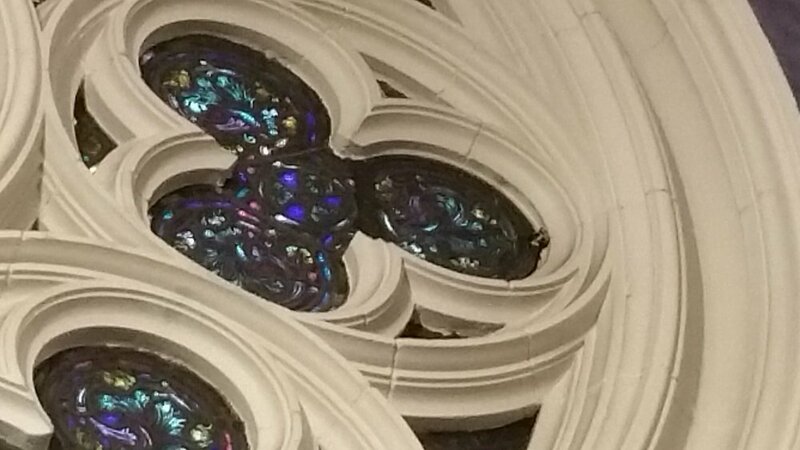 More verbiage: The brilliance of the south-facing Rose window in the Chancel wall is dimmed by a damaged exterior protective cover, referred to as “storm unit”. Correction of the defective Storm unit is an opportunity to plan much-needed maintenance of all windows. The Sanctuary building envelope is protected by a new roof and flashing system completed this year, which carries a 20 year warranty. The Church House and 2095 Broadway also have new roofs.